The fifth HMS Illustrious (R06) is an Invincible-class light aircraft carrier of the Royal Navy, affectionately known as 'Lusty' to her crew. She was laid down at Swan Hunter on the River Tyne in 1976, and launched in 1981. As the ship neared the end of its fitting out period, the Falklands War broke out. As a consequence, work on Illustrious was greatly sped up. The war was won before Illustrious could be finished, but she did perform a useful service in the aftermath. Until the RAF airfield on the Falkland Islands was repaired, an aircraft carrier was required on station to protect the area from possible Argentine attack. Invincible had been on station for many months when Illustrious steamed to its relief. However, Illustrious was needed so quickly that the ship was actually commissioned underway. 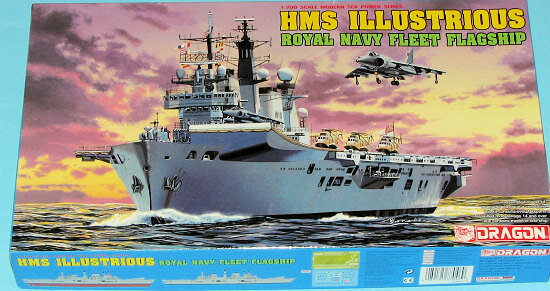 After the RAF airfield was repaired, Illustrious returned to the UK for a full shakedown cruise and workup period, with a formal commissioning on 20 March 1983. The ship saw no further action during the remainder of the decade, but continued to be a valuable asset for the Royal Navy in showing the flag and participating in exercises all around the world. During those years, the ship received several enhancements during refits, including a ski-jump with a steeper angle to enable the Harriers in the air wing to takeoff with a larger payload. During an 'Extended Defect and Maintenance Period', numerous modifications were made to the ship including the removal of her Sea Dart missile defences at a cost of twelve million pounds. This allowed for extra deck space that enables her to carry up to 22 aircraft, including the Harrier GR.7. During the 1990s, the main task of the aircraft carriers of the Royal Navy was helping to maintain the no-fly zone over Bosnia during that war there. All three of the navy's carriers rotated through the area. In 2000 she took part in the Operation Palliser the aim of which was to restore peace and stability to Sierra Leone in which she led a naval task force comprising HM ships - Ocean, Argyll, Iron Duke,Chatham and numerous RFA ships. A notable combat deployment for the ship took place in late 2001. A large British exercise, Saif Sareea II took place in Oman in the autumn of 2001. During the exercise, the World Trade Center was destroyed by Al Qaida. Illustrious remained in theatre while other elements of the task force returned to the United Kingdom. Illustrious had elements of the Royal Marines on board, ready for possible combat operations in Afghanistan. No deployment was made before Illustrious was relieved by Ocean in early 2002. In mid-2003, the ship entered a further refit at Rosyth Dockyard. This refit involved the total rebuild of the ski jump, the adding of better communications and reconfiguring the ship so that it can be more quickly switched between the light aircraft carrier and helicopter carrier roles. The refit should enable her to carry on until 2014, when it is expected that the first of the Queen Elizabeth class aircraft carriers will come into service. Illustrious returned to Portsmouth following the completion of the refit in December 2004. Molded in Dragon's usual grey plastic, I noticed that all of the sprues save two of them are marked for the Invincible. There is one that has nine parts on it, the 'G' sprue, that are for extension bits for the forward ramp and a different radar tower amidships. 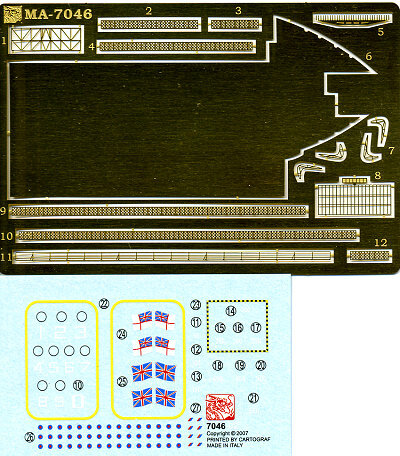 The other is a clear sprue with new Harriers and a pair of Merlin helicopters, all molded in clear plastic. Most of the kit has raised detailing and this includes the flight deck markings. I guess this is because it is an older kit, but I'd have wanted those to be finely engraved on a new kit. There are engraved port holes and vents on the main hull while the superstructure of the island is a sort of mix of the two. 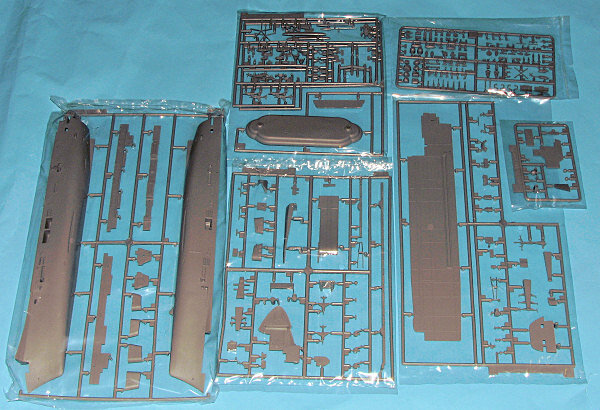 Another, unmarked sprue carries a variety of shipboard weapons, boats, radar domes and a Lynx helo. Only a few of these items will be used in the build. A photo etch fret is included that is mostly for the radar antenna and for safety nets around the deck edge. The large flat piece you see is used to fair in the new bits in the front near the end of the ski ramp. Instructions offer several nicely done construction sequences that also provide color information for some of the smaller parts. Colors are from the Gunze line and one is basically going to paint this one in Grey with a large black waterline and red lower hull. The kit hull does have a demarcation line to help with masking. As this is a full hull kit, there is a nicely done display stand to go along with it. Though the box shows a waterline option on the side of the box, it doesn't exist unless you cut the hull. 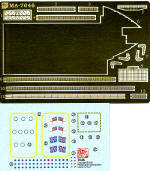 The decal sheet provides sufficient markings for the ship and aircraft and is well printed. While I am not an expert on the subject it looks to me to be a very nice kit. The upgrades that Dragon supplied are very nice to have and the ensuing model should be a good one. My thanks to www.dragonmodelsusa.com for the review kit. Get yours from your local hobby shop or ask for it if they don't have one in stock.